This happened and I'm super sad. It's already at the jeweler for repair but I have to wait a week. And in all my pregnant insecurity I went and bought a knockoff at Nordstrom. "People might think I'm only engaged because I'm pregnant!" I blame hormones for being completely lame. Tell me you guys do silly stuff like this too?! Haha, I don't judge you at all!!! Mine stopped fitting a few months in, too! OMG I am so "protective" about my rings - I would feel the same way so don't stress about it! I hate when mine is even dirty, it needs cleaned so bad right now! Oh man, I hate not having my ring on too!! I wear knockoffs to the gym so I don't lose a diamond, but my jeweler is way up in DC so its a lot more complicated for me to get it fixed! Oh no! That happened to me a few months ago. It bothered me so baldy only wearing my engagement ring, so many people asked, "are you engaged?". I was so happy to get it fixed, luckily it only set me back $75. I am always SO worried one of my band diamonds will fall out. I am constantly checking to make sure they're all there. I am sure I would do the same thing and go out and buy a replacement for the time my band was being repaired. Boo to your band losing a diamond. I'd totally do the same thing too! Sometimes when my husband forgets his ring in public I worry people will think he's having an affair with me hah. And I don't have pregnancy hormones to blame, either! Oh no! What a bummer that a diamond fell out...but at least you're getting it fixed! My husband's brother's wife only has an engagement ring, she doesn't have a band. She says that she doesn't want one and that she "likes looking down at her finger and only seeing a big rock"...and i think, "whatever you say weirdo". I know, I'm mean. That is one of my biggest fears-losing a little diamond on a piece of jewelry. I'm always checking to make sure everything's accounted for! I would most definitely do the same thing! I had to part with my engagement ring for about a week a few months after we got engaged, and I was terrified that I would see someone I knew and they would think that my engagement was called off. So ridiculous that we even care, but I totally understand where you are coming from! My fingers swelled up so much during my third trimester with Mac that I couldn't wear my rings. I felt naked (and judged) without them, being so obviously knocked-up! :) Our jeweler is a good friend and gave me a loaner band to wear for a few months until my hands returned to their normal size. I feel ya, girlfriend. 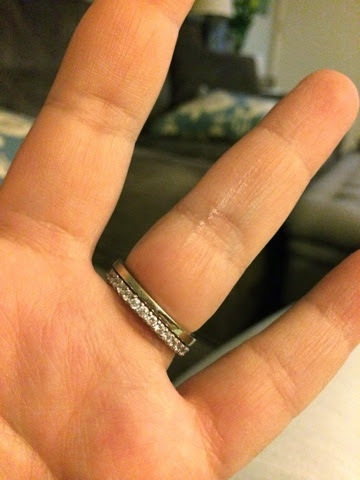 Boo to losing a diamond in your wedding band - you are too funny to run out and get a knockoff! 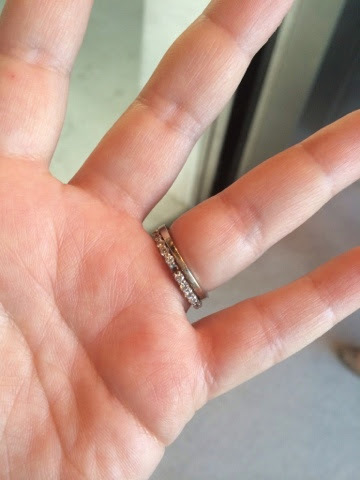 I had to get my ring fixed once - it was the longest week ever! my stepmom did the say thing when she was without hers. Awww that's the worst! But at least you have something to hold its place for now! That's so funny. So frustrating though. Hope it gets fixed in no time! Aww! I understand! Though I don't always wear my rings anyway - less so now that I'm a busy mom. But I do get questioned about why I'm not wearing my rings (from people I know), and wonder if strangers think I'm a single mom. Totally normal!!! I bought this cheapy set of 5 plain bands from Target and I would keep two in my car and one in my purse in case I forgot my rings!! I was so crazy about being judged because I was pregnant and now I think about it even more that I have a kid. I don't know why I assume people are staring at my hand thinking oh look a single mom. Hormones make us do crazy things! that phone cover is SO CUTE! and you already know, but your pup is adorable :) I can totally relate about your ring, haha I would think the same way! p.s. i love your bump update pics on insta ! !